One of 25 « Vote for Vernon Wells! Here is Vernon Wells on my latest completed ballot, one of the 25 I will be submitting online. You’ll find him as the last player in AL outfielders because they are listed alphabetically, so just click on the last name there and then add any other Major Leaguers who you think should accompany Vernon on the field July 11 at PNC Park. 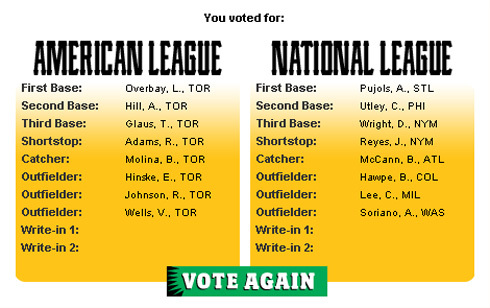 As you can see, I voted the Blue Jay ticket so Vernon would have familiar faces alongside him in the Midsummer Classic. Vote now.